Every special event should have a happily ever after. Our enchanting fairytale castle candle favors make a magical addition to your storybook day. They are perfect for decorating your party tables and to give to your guests as a memento of your joyous event. Each candle favor measures 2" x 2". The frosted white glass holder includes a poured candle inside and rests on a painted poly resin base with an iridescent white and silver accented castle design. We packaged each candle favor individually in a clear box with a silver base and tied it with a white organza bow and attached a castle themed "For You" tag. Guests tell us "This was perfect for our wedding theme" because "the castle looked very high quality for the price." The describe the packaging as "ready to put on the table, with a cute organza bow." Some Brides said they used this for their "Bridal Shower" and others "as decor in the Bridal suite, to add to the ambiance". Overall feedback was that "This was a great value for the price, and we shopped around. My guests were please we gave them something memorable and useful." This is the Fairytale Castle Candle Favor by Fashioncraft. It comes in a box and a nice little sheer ribbon, a note, 'This is For You', and when you unwrap it. We've unwrapped the Fairytale Castle Candle Favor by Fashioncraft and, as you can tell, it comes in a lovely frosted glass with a candle inside. And the base is made of very durable plastic, super solid. It has a beautiful and very lovely castle with the intricate stone designs on the side, the silver rooftops, and then these nicely painted stones along the base. And when you put it together it creates a lovely castle candle holder, perfect for that fairy-themed event. And it's something that people will remember you by every time they use it. I'm having a princess baby shower ..by any chance they come in gold or pink castles? 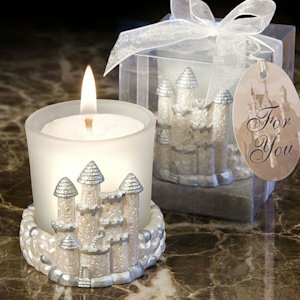 These Fairytale Castle Candle Favors are only available in white and silver accented castle design. Do you have these fairytale candles in gold or rose gold ? Unfortunately, the Fairytale Castle Candle Favor is only available in white frosted glass holder and silver accented castle design. I am inquiring about the Fairytale Castle Candle Favors-- does it come with a box and a tag? Each Fairytale Castle Candle favor is individually packaged in a clear box with a silver base tied it with a white organza bow, and a castle themed "For You" tag is also attatched. This is perfect for decorating your party tables and to give to your guests a memento of your joyous event.